Carla, Man and Narrator are sitting in a pub in Amsterdam for their evening meal. “It was good to continue our quest in Amsterdam this afternoon with two sermons in stone. Tonight you wish to give us a brief description of the life story of Emo”, says Man. “Your prelude to intensities and associations was impressive in brevity and versatility”, says Carla. “Thank you for this compliment. The life story of Emo of Friesland – priest, theologian, scholar and abbot in the 13th century – shows a nice contrast and a resemblance with the changes during the Reformation in Holland in the 16th century. His life shows at the same time a similarity and a unbridgeable rupture with the pastors, scholars and Protestants after the Reformation. Emo of Friesland – in Germany known as Emo van Wittewierum and in the Netherlands as Emo van Bloemhof – was born around 1175 AD near Groningen within a family that belonged to the elite of the “Ommelanden” around Groningen. These “Ommelanden” were part of Friesland, but the city of Groningen and the areas west of the city belonged to the Diocese of Utrecht; the land north and east of the city of Groningen belonged to the Diocese of Münster . This separation had started because the areas Christianised by Boniface  – in the eighth century AD working from the Diocese of Utrecht – became part of the Diocese of Utrecht. Boniface converted these areas preaching in the old Frisian language instead of Latin. The areas converted by Liudger  – the successor of Boniface and the first Bishop of the Diocese of Münster – ordered by Charlemagne, became part of the Diocese of Münster. The separation between the sacral power and profane power was usually virtual at that time. 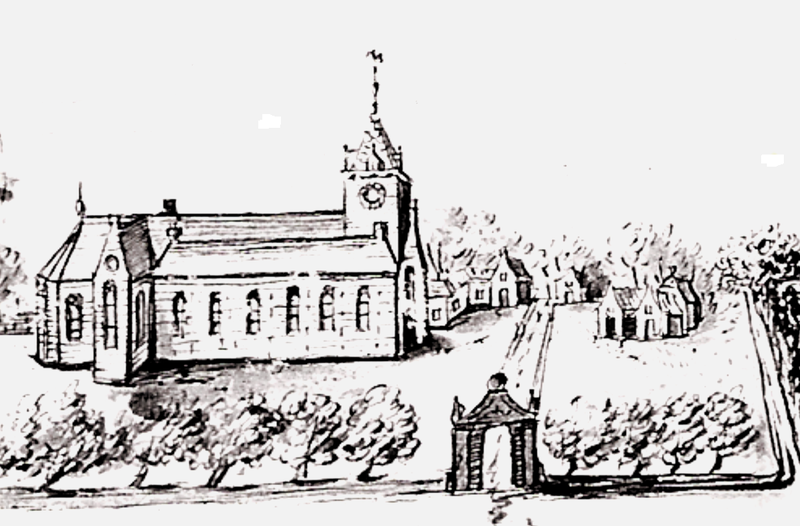 Emo had attended the school of a Benedictine monastery in the “Ommelanden” where after he had studied church law at the Universities of Paris. In 1190, he was the first foreign student at the University of Oxford. Thereafter he had attended the University of Orléans in France . We can only surmise how he had made the study trips; probably he had travelled overland on foot – whereby he had mostly stayed at clergymen or in monasteries – and part of the trip to England he had travelled by boat. During his studies he had mainly used Medieval Church Latin, supplemented by Medieval English – old Frisian was akin to old English – and flawed French for daily contact with the local population in France. After his studies, he had been teacher schoolmaster in Northern Groningen around 1200 AD and afterwards pastor in Huizinge. In 1208 AD Emo had entered the convent of his cousin Emo van Romerswerf. 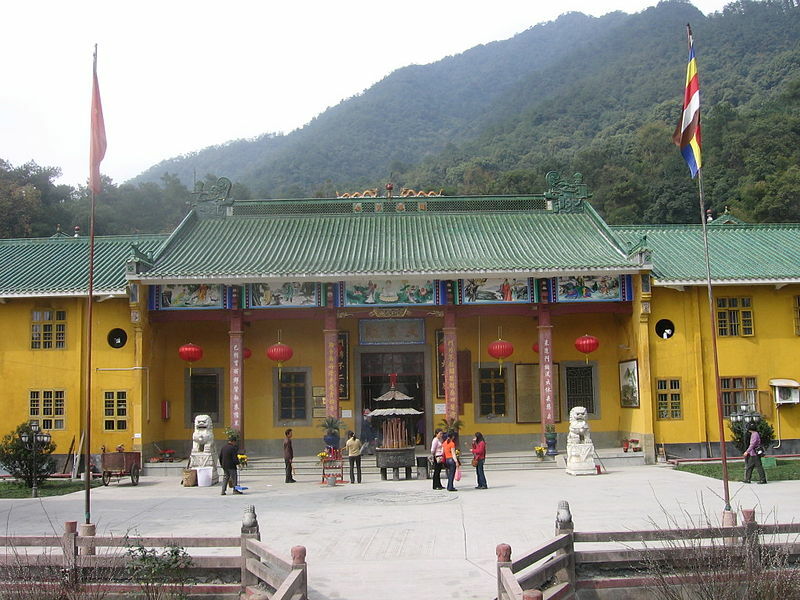 This monastery joined in 1209 AD – one hundred years before founded – the order of Premonstratensians . By a donation of the Church of Wierum (Wittewierum) Emo had founded the monastery of Bloemhof. 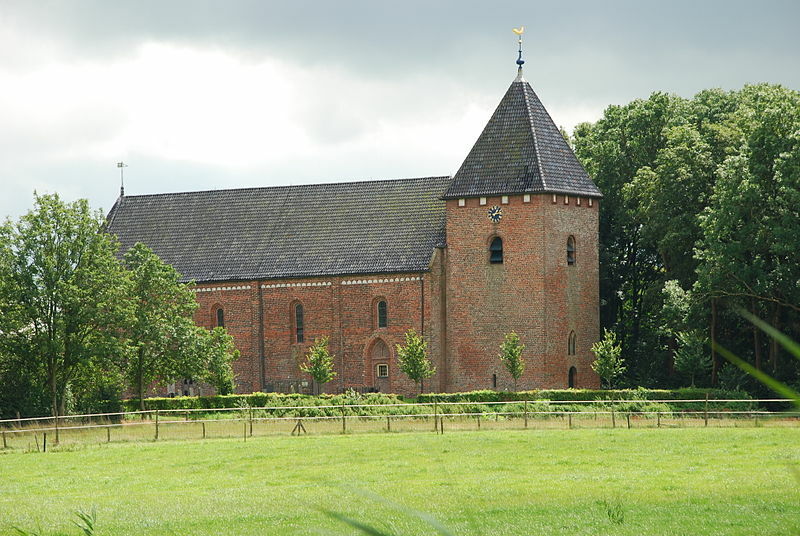 The Bishop of Münster had wished to reverse the donation by this Church – located in the northeastern “Ommelanden”, because the Bishop was concerned about the strong rise of the various monastic orders (Premonstratensians, Cistercians) in Friesland and Groningen with an independent authority of the monastic order outside the worldly sacral power. Emo – with his knowledge of Church law – had defied the decision of the Bishop and in 1211-1212 AD he had travelled by foot to Rome to set the decision of the Bishop for discussion with Pope Innocent III. In 1213 AD the monastery could officially be founded under the name Hortus Floridus; hereby may be conclude that Pope Innocent III had accepted the donation of the worldly Church of Wierum to the monastery. In 1219 AD Emo had witnessed the Saint Marcellus flood that caused 36,000 casualties and resulted in a famine . The monastery is located on a mound, hereby the damage to the monastery had probably been limited; also at that time the rich farmers and the clergy in Northern Groningen knew where to establish their farms and monasteries. We know the life course of Emo – and herewith a part of the life of the “Ommelanden” in relationship to the world of the 13th century AD – so detailed, because Emo had started with the well preserved “Chronicle of the monastery Bloemhof at Wittewierum . The decline of the influence of the monastic orders in Friesland and Groningen – and also in England – began with the rise of the Reformation in 1521 AD. With this Reformation, the authority, the knowledge and the influence of the monasteries and the Church with its centuries old customs and habits were defied, just like Emo – with his knowledge of Church law as a literate man –had defied the authority of the Bishop of Münster three centuries earlier in order to give his life and work shape in the monastery Bloemhof. The unbridgeable contrast between the mindset of Emo in the thirteenth century and the conceptual framework during the Reformation in the sixteenth century, is evident from the manner whereby the right is sought on their side during disagreements. 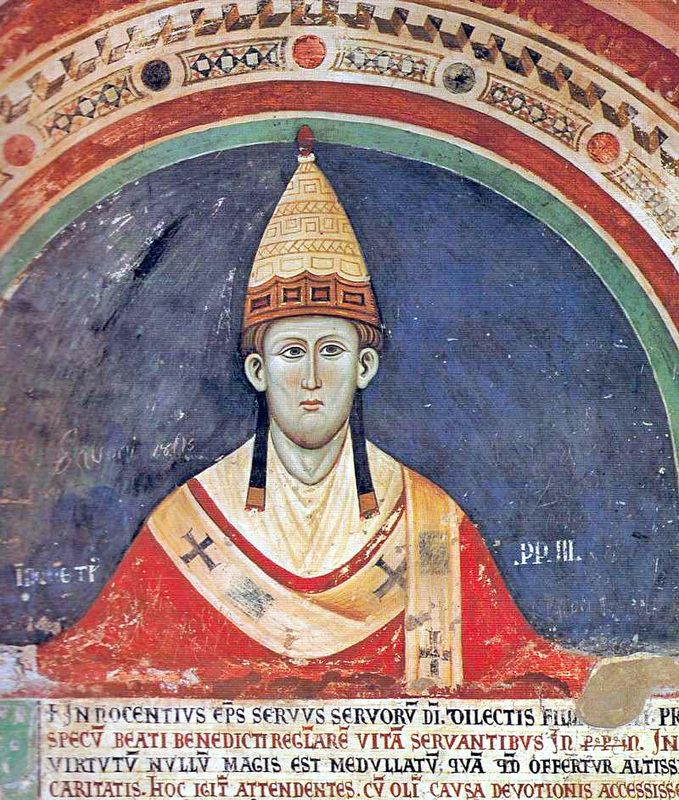 In his stubbornness Emo had sought – and probably received – his right in his dispute with the Bishop of Münster by submitting his case to Pope Innocent III. An impression of the scope of the worldly power of Pope Innocent III: he had contested the Cathars; he had excommunicated the English King John of England; he had forced the French King Philip II Augustus to take his wife Ingeborg – from whom he had been divorced – back again; he had succeeded in the deposition of the German Emperor Otto IV . In their stubbornness the Protestants had proclaimed many aberrant religious doctrines during the Reformation, that were also proclaimed by many Catholics. The Protestants were not drawn or pushed in a schism by their different doctrines, but by their stubbornly clinging to these different doctrines. The cause of their separation was the refusal of Protestants to take back their words “unless convinced by the Holy Scripture – that the Protestants had started to study independently within their own faith community – and by pure reason” . Where Emo and the Bishop of Münster had finally accepted the opinion of the Pope and the Catholic Church, the Protestants had followed only the judgement of Holy Scripture and their own pure reason. In the Netherlands the Protestants were drawn or pushed by their stubborn clinging to different religious doctrines in a rebellion with King Philip II, who was an equal to the Protestants in stubbornness and piety , who certainly had as many issues with the Catholic Church, which had fought with and against the Pope of Rome  as befits a worldly king in those days, but who had eventually accepted the Catholic doctrines and practices. Partly due to the different internal positions in religious affairs and under the influence of the “pure reason” – whereby in Holland commercialism is never lost sight of –, the Protestants in Holland had decided to a marriage of convenience between Church and State . From this marriage of convenience between Church and State, the Dutch Republic  had arisen as first republic in world history. Tomorrow more about the start of the Reformation at our visit to the Old Church of Amsterdam”, says Narrator. No one of the assembly answered. As commentary tot his Buddhist question was written: “It is not Yunmen’s personal answer, everyone’s light makes this answer” and “All humanity embodies the radiant light” and “Know that the radiant light that each and every person embodies, is each and every person that is actualised” and “Even if the church, the kitchen and the monastery gate are the ancestors of Buddha, they cannot avoid being each and every person” . From the point of view of Indra’s Net, it is an easy question, but in everyday life it is difficult to accept the light in the eyes of each and every person”, says Man. “In times of rebellion against (supposed?) injustice – in society or in religious questions – a situation that previously was experienced as perfectly normal, is now seen as a unacceptable injustice. During the Waning of the Middle Ages, Holland had lived according the rhythm of the Catholic Church, but with the rise of book-printing – whereby literate people started to study independently – mindlessly following old customs and faith according to the habits of the then Catholic Church did not fit any longer. The radiant light had changed during the Reformation. Did the radiant light change because humanity had changed during the Reformation? Is the radiant light so all-encompassing that it can also contain any injustice? I think the latter, but for me it is hard to accept”, says Carla. “Is the radiant light – just like the Gods – tied to the law of cause and effect, or can the radiant light surpass partly or entirely from this law? Perhaps both. Shall we have another beer before we ask for the bill?”, says Narrator. “I like a Belgian Tripel Trappist beer because this beer filters the light so beautiful”, says Man. “For me a Gulpener Pilsner as a reminder of the light of my uninhibited youth”, says Carla. “I will buy these beers from the the proceeds of the musical performance at Centraal Station this afternoon”, says Narrator. Source: Fernández – Armesto, Felipe & Wilson, Derek, Reformatie – Christendom en de wereld 1500 – 2000, Amsterdam: Uitgeverij Anthos, 1997, p. 108. This entry was posted in Five, Five - Intensity and association and tagged Abbott, Au Bout du Monde, Bloemhof, Boniface, Buddist question, Catholic, Catholic Church, Charlemagne, Diocese of Münster, Diocese of Utrecht, Dutch republic, Emo, Emo of Bloemhof, Emo of Friesland, Emo of Wittewierum, Friesland, Groningen, Holy Scripture, Hortus Floridus, Huizinge, Indra's net, King Philip II, Liudger, Marcellus flood, Ommelanden, Pope Innocentius III, Pope of Rome, Premonstratensians, priest, Protestants, pure reason, radiant light, Reformation, riot, scientist, St. Jans church, theologian, University of Orléans, University of Oxford, University of Paris, Waning of the Middle Ages, Wierum, Wittewierum, Yunmen on 17 February 2014 by Jan van Origo. “The square in front of Amsterdam Centraal railway Station is a good place to meet Narrator again after his trip from Florence . I hear his specific rhythm in the bongos of the jazz band that plays Nature Boy  of Eden Ahbez  in the distance”, says Man. “I hear, Narrator has seen us; he changes his rhythm”, says Carla. But very wise, so worldly-wise. “The text of Nature Boy is adapted for us”, says Man. After playing this song, Narrator takes his bongos, he says goodbye to his fellow musicians and he stands with Carla and Man. “Beautiful song. Thanks for your card. Why did you invite us here as a starting point for the survey of “Intensities and associations” at the second common reality on our Odyssey to “Who are you”?”, asks Man to the Narrator. “In the Golden Age at the beginning of the Reformation the smaller sea-going vessels – that had returned laden with merchandise from distant lands – had moored on this place. In the 19th century Amsterdam Centraal railway Station was built at this place. Before the Reformation many expressions of the Christian faith could be seen everywhere throughout the city. Now we can only see two beacons of Christian faith from here. In the distance we see the tower of the Old Church , before the Alteration  – whereby the Catholic administration in Amsterdam was deposited – the Old Church had been named the St. Nicholas Church after the patron of sailors. Here before us on the waterfront we see the Roman Catholic Basilica of Saint Nicholas  that had been built at the end of the 19th century as the third St. Nicholas Church; the second St. Nicholas Church which is now known under the name “Ons Lieve Heer op Solder” , is a hidden church on the Oudezijds Voorburgwal, . As introduction to “Intensities and associations”, I suggest to visit this afternoon the Basilica of Saint Nicholas and the Round Lutheran Church at the Singel for two sermons in stone that emerged from the Protestant Reformation. 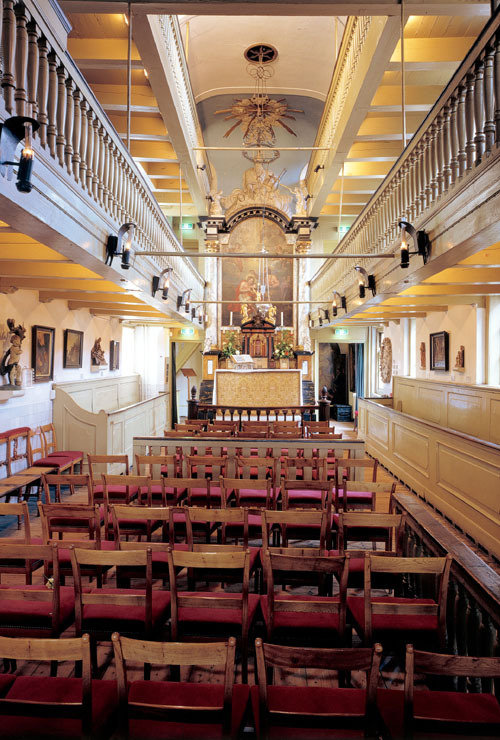 We can visit tomorrow the Old Church in the Centre of Amsterdam to look at the start of the Reformation”, says Narrator. “The Basilica of Saint Nicholas has a Christian cross as floor map as many traditional Catholic churches; but a real church tower is missing and the Church is incorporated into the street plan instead of directing to the east”, says Man. 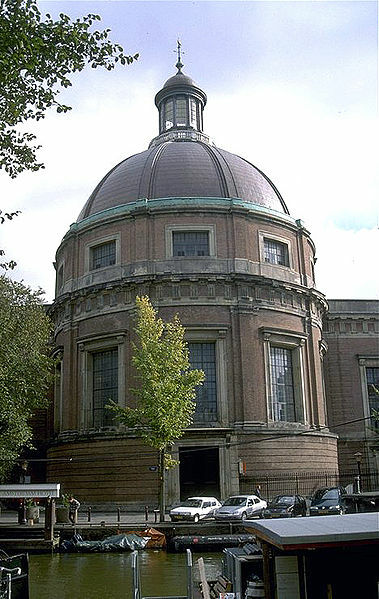 “I wish to show you the dome of the Basilica, because the ceiling displays the huge change that the Reformation had also caused within the Roman Catholic Church in Holland. Shall we go inside?”, asks Narrator. Carla, Man and Narrator walk to the Basilica and go inside. “The ceiling of the dome shows no painted sermon of the Catholic faith ordered to the Medieval Scholasticism with a Divine Trinity, a Roman Catholic worldview and heaven. This dome only shows the images of the four Evangelists of the New Testament and thus a reference to the Word of God in which the Son of God was sent to Earth for the salvation of the faithful. 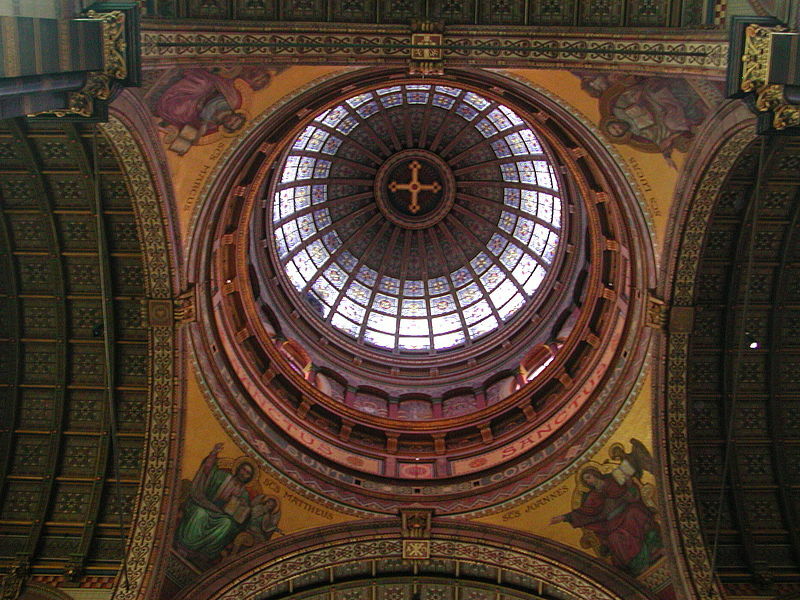 According to the painting of this dome, the four evangelists are the connection to the Divine Light. The reference to the Word of God – that the spectator could read alone after the rise of the printing press – in this painting of the dome has taken the place of the story in images in the domes of the churches in Florence. This change in the painting of the Church dome from the image of the self/Self according to the Medieval Scholasticism in the Florentine churches to the painting in this dome of intermediaries that refers to the Light of the Other – the invisible God –, shows similarities with the third revolution in the scientific development  with a reference to the open-minded and non-normative representation of the Light of the Other – in this case the Divine Trinity”, says Narrator. “Also in this Basilica the light shines from above. With the light as hope for the resurrection, the dome itself shows the constant resurrection. “Et lux perpetua luceat eis –and let perpetual light shine upon them ”, says Man. “On whom shines the perpetual light? Let’s rest this question until later on our quest. In Holland I am a woman from the South, in Florence I am a woman from the North. Although I think this Dome is also excessive, I feel more at home in this church than in the lavish churches in Southern Europe”, says Carla. “Good question with many answers over which is fought hard. Many thought that they exclusively possessed the Divine Light whereby other lights had to be extinguished with fire and sword. Shall we go to the Round Lutheran Church at the Singel to observe the influence of the Reformation on Protestantism”, says Narrator. While Carla, Man and Narrator walk from the Prins Hendrikkade to the Singel, Narrator asks Man : “On which Buddhist question are you now working?”. This question is very well applicable to the Reformation during the 80 year war in Holland; whose emergence and disappearance took place during this Reformation. What is “The” severing of entangling vines – arise and vanishing in profusion – of Christian faith in Holland? I do not know; “Mysterium est magnum, quod nos procul dubio transcendit” of “The mystery is great, that transcends us doubtless” “, says Man. “Life consists of change, but when everything is constantly changing, then change continues as a fixed constant. We have immediately mentioned the contradiction in this reasoning and in this starting point”, says Carla. “I’m not so sure. The comments to this question states: “You don’t see the constant mover” and: “If you – the divine light? – agree, you have not yet escaped the senses, but if you disagree you are forever sunk in birth and death” . This is a difficult question; it looks similar to the dilemma of the true faith and the direct relationship with God that the believers in Holland have constantly struggled with during and after the Reformation. There we see the Round Lutheran Church as a fortress in the shape of a donjon. 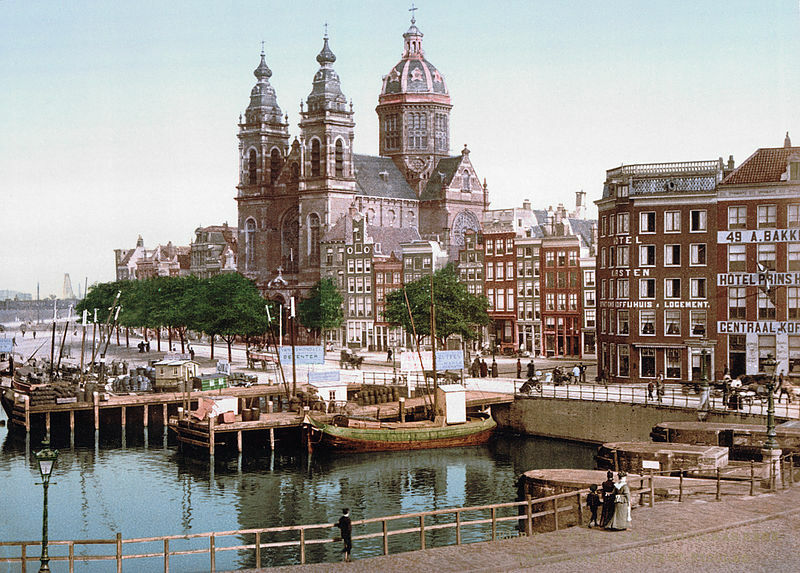 The Lutherans were not allowed to build a church with a tower in Amsterdam”, says Narrator. “This Lutheran Church reminds me of a hymn that I have learned at the Gymnasium in Rotterdam: “A mighty fortress is our God. A bulwark never failing” and “The enemy is nearing with raised flag”. At the end of this hymn is the verse: “God’s word will remain in eternity and not waiver an inch”. Let’s enter this bulwark”, says Man. 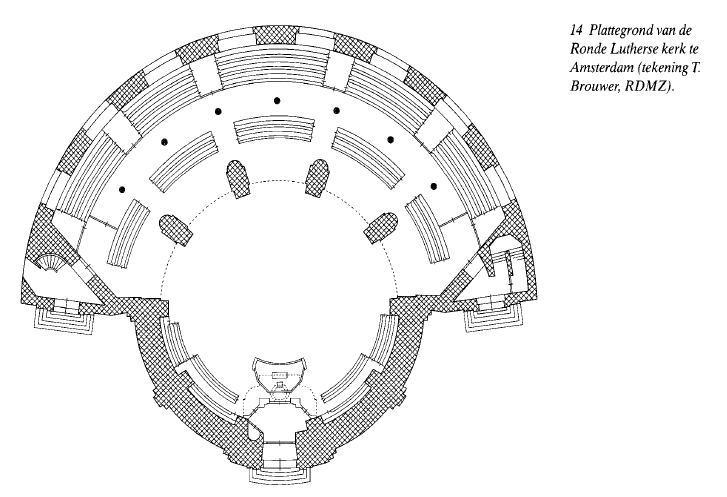 “The floor plan of the Church shows that the church-goers – as municipality in a circle – have focused their attention on the minister of the service: also these human municipalities need a “person in the middle” in order to establish and maintain mutual trust. The Church has no pictures, also no image of a Christian cross in the floor plan. In this church the rituals and the sermon in pictures have passed in the sermon of God’s Word. In this church sings no choir in the background, but the municipality sings at the top of their voices. The expressions of faith have changed from images, references, associations and persons in the middle as mediator for a relationship with God into an internalisation of God’s Word and singing of hymns together. In this church, it is important to be elected within God’s mighty fortress with a direct relationship with God, in which the minister expresses the common relationship with God”, says Narrator. “This Round Lutheran Church shows me a donjon – a shelter and a private meeting – for the faithful and a rejection of and fear of infidels and dissenters. The Basilica of Saint Nicholas refers me as well via the evangelists to God’s Word, but is more distant in the reference to God and opener to outsiders as Christian beacon. The latter may have to do with my Catholic upbringing in South Limburg”, says Carla. “Tonight I wish to give a short description of the 13th century Abbot Emo of Friesland as a contrast to the Reformation in the 16th century in Holland”, says Narrator. In Sanskrit – the language of gods in the world of humans – “man” means amongst others “tot hink, to believe and to observe”. See a description of this third revolution in science: Origo, Jan van, “Who are you – A survey into our existence, Five common realities – Facts and logic”, Amsterdam: Omnia – Amsterdam Publisher, 2013, p. 50 en 51. This entry was posted in Five, Five - Intensity and association and tagged Alteration, Amsterdam, Basilica of St. Nicholas, Buddhist question, Christian cross, Christian faith, Constant mover, Divine light, divine trinity, Donjon, Eden Ahbez, Emo van Bloemhof, Eternal light, Evangelists Florence, fortress, Holland, Lutheran Church, medieval scholasticism, minister, Nature Boy, New Testament, Odyssey, Old Church, Ons Lieve Heer op Solder, Pope John Paul II, priest, printing, Protestantism, Reformation, Roman Catholic Church, Round Lutherse kerk, sermon, Thomas Cleary on 12 January 2014 by Jan van Origo.